Initiated by Citizens For Europe (CFE) and the Bertelsmann Stiftung, the re-granting and micro-granting scheme “Action Fund ViRaL – Strengthening Diversity, Combating Racism, Engaging Locally” links the networks, expertise and reputation of a non-profit organization with the financial engagement and funding objectives of a foundation. Both work together to reach and support those who stand against racism and exclusion at the local level and in rural areas, who are outside foundations’ radar, who do not have a legal status, never received a fund before or who simply would not apply otherwise. ViRaL combines both a financial grant of 5.000€ and a year-long tailored accompanying program to empower the grantees to grow, professionalize and implement their project idea impactfully. ViRaL started its pilot phase in March 2018 and currently supports ten projects across Germany that were selected from more than 180 project applications in the first round. What was the motivation behind the re-granting and micro-granting scheme? Before the background of the latest developments in Germany, that exposed an increasingly fragmented society (e.g., AfD in all parliaments, riots in Chemnitz, racism in social media), it was our conviction that we need to broaden the support to those who engage against racism and for a pluralistic society and social cohesion. Broaden in the sense of geography (rural and local areas), target groups (marginalized, non-formalized or first-time-grantees), and with an empowerment program (webinar, seminars, tech-tools, etc.) and financial support that can easily be administered. 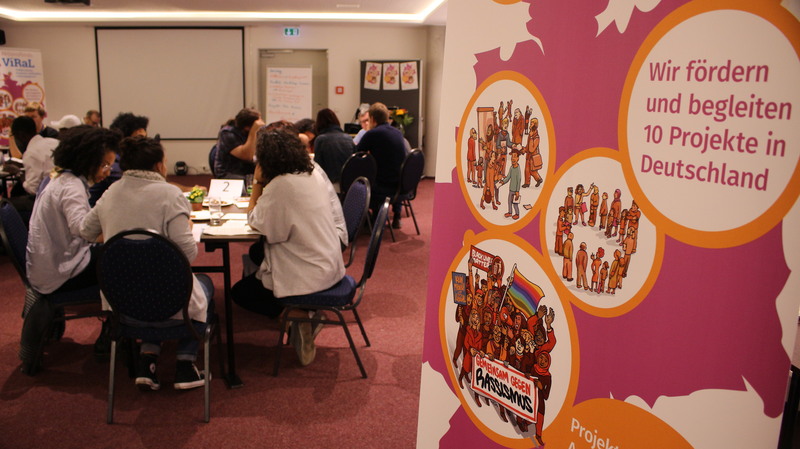 As a non-profit and civil society actor in the field we understood that our networks, our expertise in the thematic area and in empowering and accompanying activism, as well as our reputation and our flexibility on administrative level is valuable for grant makers. It enables the strengthening of untapped civic engagement and at the same time to democratizes funding strategy and decision-making. ViRaL also allowed for our own organizational development from a social business and grant receiver to a grant maker embedded in the grassroots level of civil society and activism. Who are your grantees, how did you find them and how do you support them? 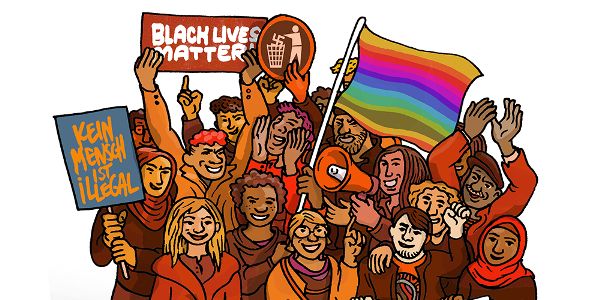 Grantees are both informal groups and established non-profit associations that are engaged at the local level to promote recognition and appreciation of diversity and to fight racism and exclusion. Grantees also include groups that are affected by racism, here ViRaL unfolds also as an empowerment program. Half of the projects are implemented in rural areas, half of them in urban areas. To identify and reach our target group we researched and contacted about 100 organizations across Germany that we knew have rather strong networks in the geographic area, especially rural area, in which they operate. We invited the contacted organizations to act as multipliers and inform their communities about the call for application, provided them with posters to disseminate about the call and set up fixed phone consultation hours per week, both for potential applicants and multipliers. The feedback from the organizations was fantastic and this dissemination practice lead to more than 180 applications in ViRaL's first-ever call. ViRaL supports the projects financially with 5.000€ in cash and with a tailored educational program that aims at empowering the groups to increase their professionality on the content and project management level. This program includes workshops, webinars, podcasts, consultations with experts, in-house seminars and much more. They include topics such as data protection, human safety, communication, anti-racism and funding. How did you financially administer ViRaL to support informal groups? We established sub-accounts at our bank, each connected to one supported project. The project owner would have viewing access to this account and be able to follow transactions. As soon as a cost is generated and the corresponding invoice is presented by the project owner, a transaction from the sub-account is executed by ViRaL, directly to the service provider. Thus, the responsibility for the financial documentation is shared with the project owner. The reporting to the financial authorities along the non-profit rules lies with ViRaL. This limits the burden for non-formal groups and allows them to participate in the grant-scheme. How do you plan to develop your re-granting and micro-granting activities? We want to scale our experience as non-profit and activists organization in the field of re-granting and micro-granting and offer it to foundations and philanthropists. We see a huge potential in the collaboration of funders and non-profits in designing and implementing a granting scheme. It brings the advantages of both worlds together, concerning networks, reputation, human resources, thematic expertise, visibility, flexibility and much more. It allows funders to re-think and further develop their role and impact as philanthropists. It allows non-profits to make their experience as a civil society actor in the field more visible, allowing them to become more resilient, also financially in the sense of a social business opportunity.